This recipe was written for a competition that's disappeared from the radar. When the economy went south, some cooking contests were discontinued and the prize structures of others were drastically changed. A lot of us have recipes sitting in limbo as a result. This is one of my captives. The dish is a favorite of Bob's and he asked me to make it for dinner one night this week. I honestly had forgotten how good it is, but when I made it tonight I knew I'd have to share the recipe with you. It would be a perfect dish for Meatless Monday. It really is not hard to do and if you like macaroni and cheese with a twist, I really think you'll enjoy this. 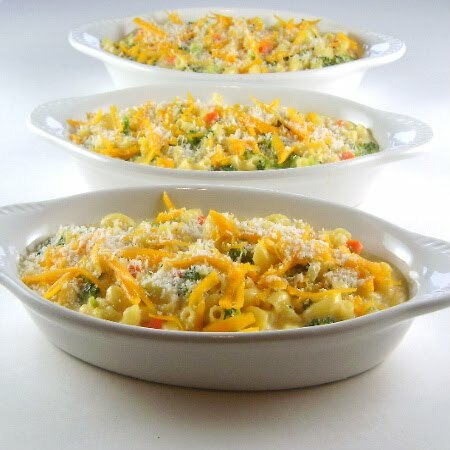 The dish is a combination of two old favorites, one is a cheesy broccoli soup and the other, of course, is a creamy mac n' cheese. While it bakes in the oven and forms a crust, this remains a creamy, rather than dry, mac n' cheese. That will be off putting to some, but I hope most of you will take a look at the recipe and give it a try. This is very straight forward dish and I have no cautions regarding its construction. 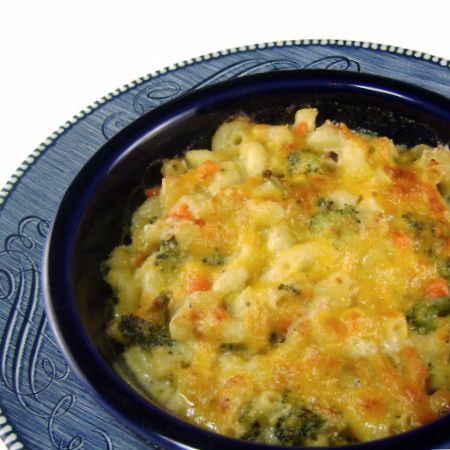 If you like macaroni, cheese and broccoli, you're in for a taste treat. Here's the recipe for my house macaroni special. 1) Add water to a large pot and set to boil. Preheat oven to 375 degrees F. Butter a large gratin dish (9 x 13-inch) or 6 individual casserole dishes. Set aside. 2) Melt butter in a large saucepan set over medium heat. Add onions and carrots and saute until vegetables are tender, about 5 to 6 minutes. 3) Meanwhile, bring 2 cups milk to a simmer. Add broccoli and cook until tender, about 5 minutes. Break broccoli into small pieces with a spoon. 4) Add flour to carrot and onion mixture and cook for 2 minutes without allowing it to brown. Slowly whisk in reserved 1 cup milk. Whisk in cream. Add milk and broccoli to sauce. Reduce heat to low and simmer for 15 minutes. 5) Add garlic powder, salt, pepper and both cheeses to sauce and stir until cheese has melted. Reduce heat and keep warm. 6) Add macaroni to boiling water and cook until just tender. Drain and add to sauce mixture. Transfer to gratin dish or individual casseroles. Top with breadcrumbs and cheese. 7) Bake until bubbling and cheese is melted, about 15 to 20 minutes. Serve immediately. Yield: 6 servings.